This treehouse presents materials for exploring marine life. In addition, teachers in the Tucson, Arizona area can use these materials to complement a visit to the UA Marine Discovery Lab field trip. 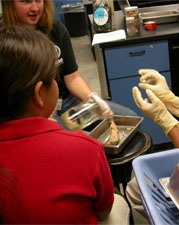 Read more about the Marine Discovery outreach program. Join us in the lab to explore marine life of the Gulf of California on the Marine Discovery Field Trip. Suggestions for how to prepare your class for the Marine Discovery field trip and additional activities to enrich the experience. 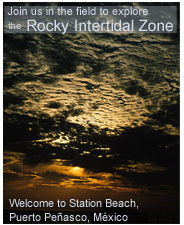 Join us in the field to explore the rocky intertidal zone at Station Beach in Puerto Peñasco México. Download PDF files of the Marine Discovery handbook. The handbook includes: teaching tips, information on marine life, instructions for the marine discovery lab activities and suggestions for engaging students in learning. View all of the Marine Discovery slideshow slides in one page. From this link you can also print out the slideshow.